Timber Pro Strip & Brite is a specially formulated professional strength stripper designed to remove tough exterior oil-based finishes. (Not for removal of Acrylic or Latex finishes). 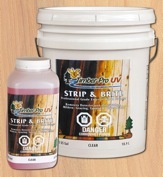 Strip & Brite will bring your previously coated surfaces back to a new wood appearance. 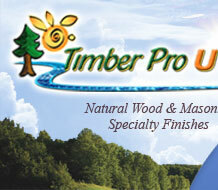 Strip & Brite will also work to remove the heavily greyed areas and dead wood fibers caused by sun damage. Following the Strip & Brite removal process, the second step is using the brightener which, once applied, will restore the original colour of the wood and bring it back to the proper pH level. stripper used for the removal of faded and peeling oil-based finishes. Easy Neutralization: The easy-to-use neutralizer is used after removal is complete, and quickly brings the wood back to its natural beauty, restoring the pH in the wood. Easy To Use: Strip & Brite can be applied easily with a low pressure garden pump sprayer, and easily rinsed off with a garden hose after its activation period.